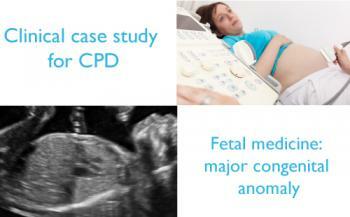 You can access the Fetal medicine – major congenital anomaly case study tutorial for just £18.60 inc VAT. UK prices shown, other nationalities may qualify for reduced prices. If this tutorial is part of the member benefit package, Fellows, Members, registered Trainees and Associates should sign in to access the tutorial. Non-members can purchase access to tutorials but also need to sign in first. New users can register here. The following case study discusses a woman who presents for her routine anomaly scan at 20 weeks of gestation. As you work through this case study, you will be asked to reflect on the investigations required, test results and management of the woman described in this case. You can claim CPD points for completing this case study in either the knowledge-based assessment category or the personal/professional category.